Small Mars camps with a limited number of explorers could lead to mega-scale colonization of the red planet. The vast plains of Mars may be the most promising place beyond Earth forhuman colonization, but is it enough for a one-way trip to the Red Planet? Tworesearchers seem to think so. In an article published this month in the Journal of Cosmology, environmentalscientist Dirk Schulze-Makuch and physicist PaulDavies argue that a manned one-way mission to Mars would not only makeeconomical sense, but mark the beginning of long-term colonization of the planet. The researchers contend that while a mannedflight to Mars and back is technically feasible now, the steep financialand political costs make such a mission unlikely to launch anytime soon. "We envision that Mars exploration would begin and proceed for a longtime on the basis of outbound journeys only," said Schulze-Makuch, who is associateprofessor in the School of Earth & Environmental Sciences WashingtonState University in Pullman. 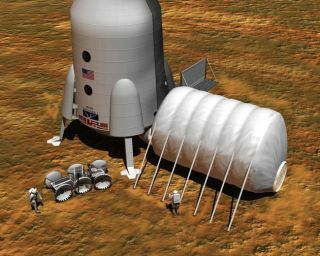 "One approach could be to send fourastronauts initially, two on each of two spacecraft, each with a lander and sufficient supplies, to stake a single outposton Mars. A one-way human mission to Mars would be the first step inestablishing a permanent human presence on the planet." On Oct. 11, President Obama signed a major NASA act into law thatoutlines the agency's future in space exploration. The signing paves the wayfor a mannedmission to an asteroid by 2025, with an expedition to Mars to followsometime in the 2030s. A manned trip to Mars would take roughly six months using available launchoptions and current chemical rocket technology, according to the new study. TheRed Planet has atmosphere, moderate surface gravity, abundantwater and carbon dioxide, and range of essential minerals ? making it anattractive target for potential human colonization. A one-way mission to Mars would be accompanied by obvious risks. However, danger is often an inherent part of exploration, and has beenthroughout history, the researchers said. "It would really be little different from the first white settlers ofthe North American continent, who left Europe with little expectation ofreturn," said Davies, a cosmologist at Arizona State University inPhoenix. "Explorers such as Columbus, Frobisher, Scott and Amundsen, whilenot embarking on their voyages with the intention of staying at theirdestination, nevertheless took huge personal risks to explore new lands, in theknowledge that there was a significant likelihood that they would perish in theattempt." The scientists stress that such an expedition would not amount to a suicidemission, but would instead culminate in a series of missions over time, with aneye toward suffiently supporting long-termcolonization. The proposed project would begin with selecting an appropriate site for theMartian colony, ideally associated with a cave or other natural shelter, aswell as other nearby resources, such as water, minerals and nutrients. "Mars has natural and quite large lavacaves, and some of them are located at a low elevation in close proximityto the former northern ocean, which means that they could harbor ice depositsinside similar to many ice-containing caves on Earth," Schulze-Makuch said. "Ice caves would go a long way to solvingthe needs of a settlement for water and oxygen. Mars has no ozone shield and nomagnetospheric shielding, and ice caves would alsoprovide shelter from ionizing and ultraviolet radiation." Schulze-Makuch and Davies propose that the astronautswould periodically be supplied with basic necessities from Earth, but wouldotherwise be expected to become increasingly proficient at harvesting andutilizing the resources available on the foreign planet. The researchersenvision that the settlement would eventually reach self-sufficiency, and couldthen serve as a hub for expanding human colonization. Schulze-Makuch and Davies suggest that buildinga human presence on Mars not only provides humanity with a"lifeboat" in the event of a mega-catastropheon Earth, but would also be a unique platform for further scientificresearch. Astrobiologists agree that there is a fairprobability that Mars hosts, or once hosted, microbiallife, perhaps deep beneath the surface, and Davies and Schulze-Makuch suggest that a scientific facility on Mars mighttherefore be a rare opportunity to study an alien life form and a secondevolutionary record. ?Mars also conceals a wealth of geological and astronomical data that isalmost impossible to access from Earth using robotic probes,? the researcherssaid in their report. ?A permanent human presence on Mars would open the way tocomparative planetology on a scale unimagined by anyformer generation? A Mars base would offer a springboard for human/roboticexploration of the outer solar system and the asteroid belt. And establishing apermanent multicultural and multinational human presence on another world wouldhave major beneficial political and social implications for Earth, and serve asa strong unifying and uplifting theme for all humanity.? But would anyone actually want to sign up for a one-way ticket to Mars? Apparently so. ?Informal surveys conducted after lectures and conference presentations onour proposal, have repeatedly shown that many peopleare willing to volunteer for a one-way mission, both for reasons of scientificcuriosity and in a spirit of adventure and human destiny,? the researcherssaid. POLL: Would You Join a One-Way Trip to Mars?